Nearly all the wisdom which we possess, that is to say, true and sound wisdom, consists of two parts: the knowledge of God and of ourselves.But, while joined by many bonds, which one precedes and brings forth the other is not easy to discern. All our real wisdom is wrapped up in knowing these two things. Or perhaps it’s better to say in knowing this twofold thing, because you can’t have one without the other, and you can’t say which one comes first. Why does Calvin begin his book by showing the circularity of our best wisdom? There are at least two reasons. First off, the fact that he starts with a tricky and dialectical statement like this should tip readers off to the kind of book he has written. It is a book that invites the reader to join him in a real exploration, a mental journey into real knowledge of the living God. Calvin writes coram Deo, in the presence of God, in order to woo and cajole his readers into understanding that they, too, are in God’s presence as they think their thoughts about him. The Institutes are not a big book of answers, but a rhetorical force that causes the reader to be moved to knowledge. To this day, Calvin suffers from readers (friend and foe alike) who treat his book as a reference work rather than an instrument of mental discipleship. So when Calvin starts with the assertion that you can’t know God without knowing yourself, and you can’t know yourself without knowing God, he is drawing his reader in so he can show them what we might call, in modern jargon, the existential situation, the always-alreadyness, the existential situation in which we find this engagement of knowledge of God and self. Immediately, Calvin makes a choice about which side of the complex knowledge he’s going to handle first. He’ll take up the side that says “no one can look upon himself without immediately turning his thoughts to the contemplation of God.” This signals his intention to trace the way from knowledge of self to knowledge of God. Here is a central theological topic easily recognized from classic sources. Will he address it like Augustine: The restless heart seeking rest in God, desiring to know nothing but God and itself? Or like Anselm: faith seeking understanding? Will he follow the path of Aquinas and the high scholasticism of the middle ages: via negativa, via positiva, via eminentia? Will he show himself to be a precursor of Schleiermacher (we know God in knowing ourselves because we have an infinite feeling of absolute dependence) or of Barth (God the subject makes himself his own primary object and takes us up into that secondary objectivity)? The options are many and rich, and Calvin stands poised before all of them when he opens his book with an account of the twofold knowledge of God and self. Calvin may be setting up an expectation that he will be showing a path from here to there, a guide to a journey from the knowledge of self to the knowledge of God, but he manages that expectation in a surprising way. He uses language about turning our thoughts to the contemplation of God, being led by rivulets to the spring itself, being compelled by our poverty to look upward, seeking what we lack, recognizing the true light by contrast with our own darkness, a light which rests in the Lord alone, how our ills prompt us to contemplate the good things of God, and how self-knowledge arouses us and leads us by the hand to find God. His language hints that we may be able to start from the solid ground of what we already possess, self-knowledge, and find the path to what we do not have, knowledge of God. That, after all, is how analogical thinking works. With a known quantity on one side of the equation, we may be able to analogize the unknown quantity, find a ratio, solve for x, and achieve knowledge of God. Self-knowledge marks the trailhead into the undiscovered country, and our feet are already on that path. “Man never achieves a clear knowledge of himself unless he has first looked upon God’s face, and then descends…” This is strong language: we must see the face of God. Look upon the face of God. Such loaded language sets up, once again, an expectation that Calvin intends now to discourse on the divine nature, the majesty of God’s essence. In a paragraph about the knowledge of God, we should expect a God-fearing author to take us to the boundary of the ineffable, to turn our eyes toward that high and lifted up eternal majesty to which no living soul can approach. 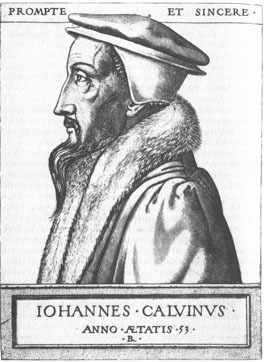 And indeed, Calvin speaks of God as “the sole standard” of what is “righteous and upright and wise and holy,” that which is utterly uncontaminated by immorality, the “thing most pure” which stands out stark against our experience of relative purity (which means: relative impurity), the “whiteness itself” which shows up our supposed experience of white as in fact an experience of a “rather darkly mottled” object, or “something dirty white.” We flatter ourselves that our sight is keen when we look at objects around us, but above us stands the “great brilliance” of the sun itself, which blunts our sight and confuses our senses. “So it happens in estimating our spiritual goods,” says Calvin, which is to say: what the sun is in the physical world, God is in the spiritual. If this reminds you a bit of Plato’s language, recall the way Karl Barth once semi-seriously characterized the two greatest Reformers: Luther is a neoplatonist, but Calvin is a classical platonist. Casual readers usually skim this last paragraph of the first chapter of the Institutes (“Sunday school time, hall of faith, yawn”), but it is crucial to the structure of the whole project. Chapter 1 has three parts, and they are related thus: knowledge of self, knowledge of God, and the attitude of the human person who is thrust into the midst of this twofold knowledge: stricken and overcome, overwhelmed and almost annihilated. This is “all the wisdom we possess, that is to say, true and sound wisdom.” A good reader of the Institutes, the active and responsive reader that Calvin expects (like Erasmus and the classical models Seneca and Plato, of whose works Calvin was a trained Renaissance scholar), comes through the first chapter of the first book in the posture of Job. Recall that Calvin’s Job commentary is longer than his Insitutes. In God you come up against something which is in every respect immeasurably superior to yourself. Unless you know God as that –and, therefore, know yourself as nothing in comparison — you do not know God at all. As long as you are proud you cannot know God. A proud man is always looking down on things and people: and, of course, as long as you are looking down, you cannot see something that is above you. And later on the same page: “The real test of being in the presence of God is that you either forget about yourself altogether or see yourself as a small, dirty object. It is better to forget about yourself altogether.” This is the point that Calvin makes in such a classic way in the opening of the Institutes. The first two pages are that good, and the next 1500 repay similarly close reading. Five Sacred Crossings: I Wrote a Novel, What Was I Thinking?